So wrote Hedda Hopper in her 1952 autobiography From Under My Hat. (Examples of other stars and their talents cited by La Hopper: “Jack Gilbert’s poetic love-making, Wally Reid’s boyishness.” It’s a one-of-a-kind book.) 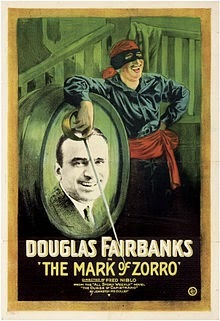 The man crowned King of Hollywood and the movies’ first great action hero – he played Zorro, Robin Hood, D’Artagnan – deserved to have a cocktail named in his honor, like two of his fellow co-founders of United Artists Mary Pickford, aka Mrs. Fairbanks, and Charlie Chaplin. Douglas Fairbanks (born Douglas Ullman) may have been a teetotaler, but Hollywood never lets facts get in the way of a story. More Hedda on Fairbanks: The actor famously had a steam room built at the studio he and Pickford owned. “That steam room was the great leveler. When he’s mother-naked, you can’t tell whether a man’s a duke, a masseur or a producer.” This fulfills my longtime dream of using the term “mother-naked” in one of these posts. It’s more likely the Fairbanks #1 was named for the actor. The recipe originally appeared in the Sloppy Joe’s Cocktail Manuals published throughout the 1930s in Cuba, the land that sired Mary Pickford’s namesake drink. Craddock and Duffy prescribe an equal parts ratio of gin, apricot brandy and citrus juice (originally lemon, now lime), while Sloppy Joe and contemporary experts prefer a spirit-forward version. While grenadine is no longer included, the sometimes-vexing egg white called for by Sloppy Joe still is. I now follow the lead of the experts and use one egg white for two drinks. The Douglas Fairbanks proves such a sterling showcase for the derring-do of apricot brandy that although the egg white adds its usual silky mouthfeel, the cocktail would taste just fine without it. One last tidbit from Hedda Hopper. When Douglas Fairbanks died, a coterie of pals led by actor/wrestler Bull Montana conspired at Hollywood’s Brown Derby to swipe the actor’s body, prop it under a favorite tree, and give him a more private sendoff. A busboy must have overheard the plan, because when Bull and the boys arrived at the mortuary the guard had been doubled. The ceremony proceeded at the Wee Kirk o’ the Heather without incident. It was a few years ago, obviously. The cocktail renaissance has since rehabilitated both drinks. (Who are we kidding? It’s buffed the reputation of every drink.) But for decades the Rob Roy was seen as archaic, the kind of tipple your grandfather might have favored. It didn’t help that the Rob Roy lived permanently in the shadow of a titan, regularly referred to as a Scotch Manhattan. (Even I did it.) But the Rob Roy has its own pleasures, and so deserves a turn in the spotlight. Which is only appropriate, considering how the drink got its name. It was created at New York’s Waldorf Hotel, which given its proximity to Broadway would regularly dub cocktails after shows. 1894’s Rob Roy featured music by Reginald DeKoven and a libretto by future Ziegfeld Follies mainstay Harry B. Smith. Who among us can forget such staple songs as “Who’s For the Chase, My Bonnie Hearts?” and “My Name is Where the Heather Blooms”? Rob Roy wasn’t a smash like DeKoven & Smith’s other tuneful telling of a Celtic hero, Robin Hood, which introduced “Oh Promise Me” (lyric by Clement Scott); it was revived on Broadway only once, for two weeks in 1913. But use the right blended Scotch like my new favorite Bank Note, with its higher single malt content, and you’ll find sustained notes that a Manhattan won’t play. The bitters remain a point of controversy. Many recipes specify Angostura, while some authorities like gaz regan say they’re never to be used here. Others suggest the more floral Peychaud’s pairs well with Scotch. I opt for orange, as called for in my copy of The Old Waldorf-Astoria Bar Book. You can garnish with a cherry as you would a Manhattan, but a lemon twist adds a few subtle flourishes. And remember, when in Seattle, visit the cocktail bar of the same name. Ye’ll find no confusion there. Strange how a creature with such beautiful plumage can hide in plain sight. A short time later, this Robert Simonson piece in the New York Times offered an update on the Jungle Bird’s migratory pattern. It was coming home to roost at cocktail bars all over the country. The drink is no spring chicken; created at the Kuala Lumpur Hilton in Malaysia, it’s been around since 1978. The recipe was recorded in John J. Poister’s New American Bartender’s Guide (1989), where it was largely ignored. Only when tiki authority Jeff “Beachbum” Berry unearthed it for his 2002 book Intoxica! did its popularity begin to hatch. What gulls galls me – all right, I’ll lay off the puns – is that I have Poister’s book on my shelf, yet unlike everybody else, I’d never heard about the Bird*. Poister’s recipe calls for a veritable flotilla of garnishes: a maraschino cherry, an orange slice, a lime slice, and an orchid (listed as optional, and thank our lucky stars for that). He also recommends you “serve in a special ceramic bird container or use a chilled hurricane glass.” You’ll take a basic rocks glass, Poister, and you’ll like it. Most bars now pour the cocktail over a single large ice cube. I freely confess I am not typically a fan of tiki drinks. More often than not you can only taste the fruit, the rum not hitting you until you wake up in Laughlin with yet another showgirl wife to explain to the uptight authorities. As Rosemarie suspected and Berry confirms in the Simonson article, it’s the presence of Campari that accounts for its success in the contemporary bar scene, its bitterness corkscrewing through the drink and preventing the entire enterprise from floating away on a cloud of sweetness. While Simonson is correct in saying rare rums aren’t required here, you’ll want a darker one that will bear up to the Campari. I followed the advice of esteemed New York bartender Giuseppe Gonzalez and used Cruzan Black Strap, the more intense (and, yes, bitter) version made from blackstrap molasses. The complex taste and texture of this spirit leave no doubt who’s in charge here. I appreciated the result more having tried a different variety first – I believe Rob Roy’s fine Jungle Bird is prepared with Amrut Old Port Rum – and would suggest doing likewise in order to understand the drink’s nuances. Perhaps a flight of Jungle Birds? OK, seriously, I’ll stop now. *Technically not a pun, but a dated musical reference.